The Yucatán Peninsula in southeastern Mexico, separates the Caribbean Sea from the Gulf of Mexico, with the northern coastline on the Yucatán Channel. The peninsula lies east of the Isthmus of Tehuantepec, a northwestern geographic partition separating the region of Central America from the rest of North America. The peninsula comprises the Mexican states of Yucatán, Campeche, and Quintana Roo; the northern part of the nation of Belize; and Guatemala's northern El Petén Department. Due to the extreme karst nature of the whole peninsula, the northern half is devoid of rivers. Where lakes and swamps are present, the water is marshy and not palatable for drinking water. Due to its coastal situation, the whole of the peninsula is underlain by an extensive contiguous density stratified coastal aquifer, where a fresh water lens formed from meteoric water floats on top of intruding saline water from the coastal margins. The thousands of sinkholes known as cenotes throughout the region provide access to the groundwater system. 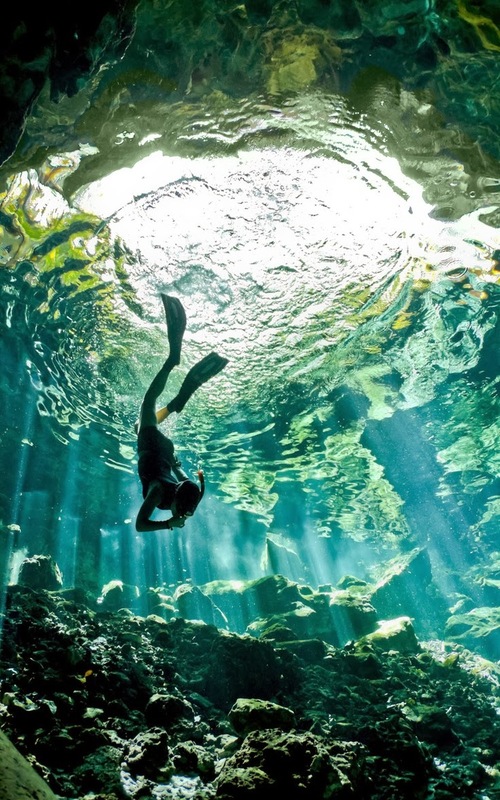 The cenotes have long been relied on by ancient and contemporary Maya people.